Coxe Cage remains an indoor facility where high school distance runners flock, for a lot of reasons. It's been known to create some magic on its 200 meter oval. But at the Yale Track Classic, which is going into its 37th year in 2019, there's also a pretty good guarantee that national-level runners will get all they bargained for in a deep-fielded 3K in New Haven, Connecticut. Few invitationals stock this distance race like Yale's annual track classic does. On Saturday, yet another elite distance race will go down within the confines of Coxe Cage. In the fast section of this year's event, it's anyone's game. 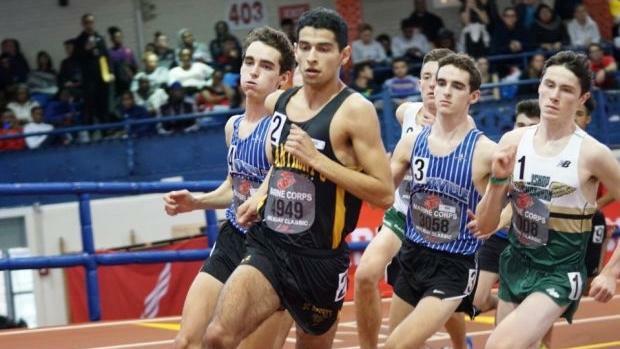 The meet record was set back in 2016 when two blue-chippers, Fordham Prep (NY) graduate Conor Lundy and La Salle Academy's DJ Principe, battled for 15 laps, though it was Lundy who pulled away from the speedier Principe, a Stanford recruit who would later go on to run 4:00.97 in the mile at the New Balance Games. That race was one of the meet's finest in its history, but there's reason to believe 2019's version could be just as competitive. The field features some remarkably talented distance athletes. Headlining the list is Saint Anthony's (NY) Matthew Payamps and Burnt Hills' (NY) Tyler Berg. While the pair hasn't faced head-to-head in a big matchup over the track season, each runner has his own strengths -- Payamps has trusted his speed to carry him in the 800m and mile over his career, while Berg's aerobic base has pulled him toward some truly great performances at 3K and beyond. Each runner's PR at 3K is nearly identical. Berg, a Nike Cross Nationals qualifier over cross country--he finished 32nd with a 5K best of 15:33.60--actually hasn't run an outright 3K since his sophomore year in 2017 at this same venue. But the New Yorker is coming off a US No. 3 effort at 2-miles at the Ocean Breeze complex in December, which translates to the fastest 3K time entering this race. Payamps finished third in this race last year, and just posted a 1:54.73 at 800 meters in December. Neither should overlook two of Delaware's finest runners. Keehan and Banko have the benefit of being on the same team--and that chemistry could prove fruitful in a race that often plays technical in the first 8 laps. Wildcards include Toolin, who laid down a US No. 1 time for 1-mile on Boston University's oval in December, and Gilmore and Cormier, who have the talent to stick with anyone up front. No doubt this race will turn into something special.